Leveraging real-time replication and application availability for disaster recovery using solutions from Double-Take Software is a cost effective way to ensure that mission-critical application's RPO and RTO goals are adequately met. Double-Take Availability from Double-Take Software delivers enterprise-class disaster recovery and high availability solutions for cutting edge virtual environments. 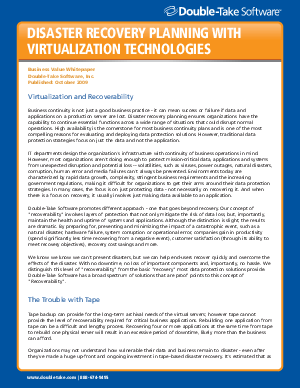 Download this free whitepaper to learn how combining Double-Take Software's replication solutions with virtualization technologies, organizations can achieve additional flexibility and cost-effectively protect their critical data and applications.